What tactic do you find the most effective while negotiating a coin purchase? 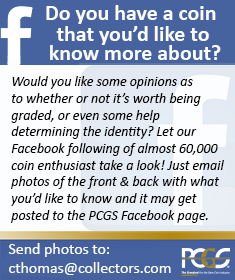 Participate in the PCGS Newsletter Survey and you could win a 1986 50C Statue of Liberty Graded PCGS PR valued at $7.00. Founded in 1792 by the United States government, the U.S. Assay Commission was established to supervise the annual testing of gold and silver coinage produced by the U.S. Mint. Beginning in 1860, to thank the members for their service, each commissioner received a medal struck by the U.S. Mint commemorating famous persons, topics and places. Today, these medals of the U.S. Assay Commission are rare and present an extreme challenge to collectors. SCP Auctions recently announced that their upcoming Fall Premier Auction will be highlighted by Olympic athlete Jesse Owens’ 1936 Gold Medal. Owens’ historic performance at the 1936 Berlin Olympic Games not only discredited the racist claims of Adolf Hitler, but also affirmed that individual excellence, not race or national origin, distinguishes one man from another. For some coins, a numerical grade alone does not suffice. Collector preferences - and consequently market value - demand the use of Designations. Designations are a rating added after the numerical grade to describe a particular attribute of a series which has importance and value to collectors. PCGS Director of Collector Education Mike Sherman explains how PCGS assigns Designations and what to look for when evaluating coins for grading. Tip #5 For Using PCGS CoinFacts: Follow the Breadcrumbs! PCGS CoinFacts contains a vast amount of information about United States coins. Learning to navigate your way through this immense amount of data is critical to take full advantage of the site. PCGS has made it easy to jump from page to page within CoinFacts by including what are known as “breadcrumbs” to guide you on your way. Last edition PCGS Pricing Expert Jaime Hernandez detailed nine ways to get more money when selling your coins. Jaime follows up with the next installment, offering insight into the top ways you can ensure you get a great deal when purchasing coins. From the negotiation to the transaction itself, prepare yourself before your next buy.